• Perfectly sized for any lab’s photo book printing website or software. 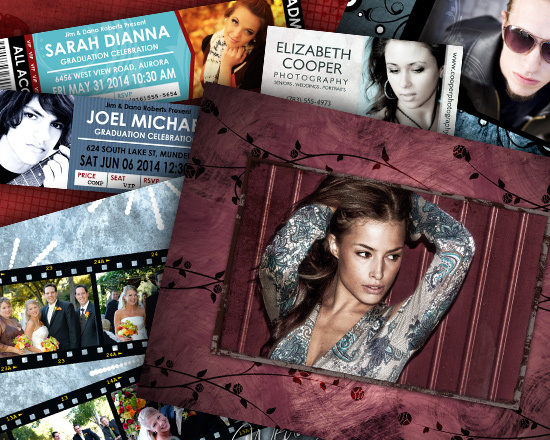 • Files are fully layered Photoshop .psd files, easily resizable for any size photo book/album. • Video tutorial included showing how to easily turn on/off white border layer styles as desired. • All text and fonts are layered and can be changed with ease. • Customize any layer and all text. • Easily add photos to the background for use with different sports. • 6 Digital Templates in the .psd file format for Photoshop, sized @ 300 dpi as noted in sample images. • Customize any layer and all fonts/text. • 56 Digital Backdrops, 8×10 inch @ 300 dpi, in the .tif file format. • 15 Digital Templates, 8×10 inch @ 300 dpi, in the .psd file format. • Photoshop video tutorial included. • 30 Digital Overlays, 8×10 inch @ 300 dpi, in the .tif file format. • Create texture on any image. • Change colors and customize with ease. • 7 Digital Templates, 8×10 inch @ 300 dpi, in the .psd file format. • Engraved text style remains even as any layer font/text is customized.